On hectic Midtown blocks, DOT said plastic "tuff curbs" would keep cyclists safe during rush hours, but now the agency has abandoned that plan. 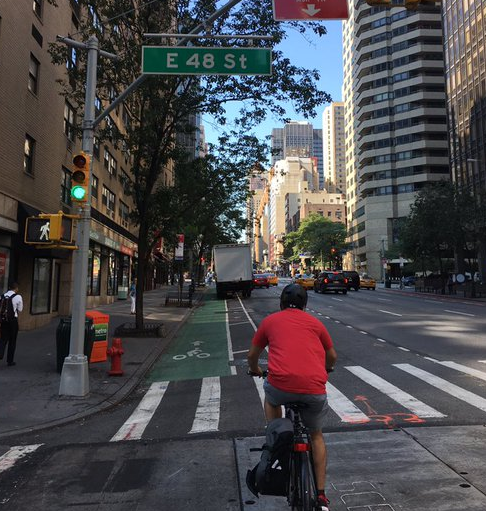 Last summer, DOT put forward a plan to install a protected bike lane on Second Avenue between 59th Street and 43rd Street. On most of those blocks at most times, the bike lane would be protected by parked cars, but during the morning and afternoon rush, the parking lane would be a moving lane. So DOT said it would install “low profile tuff curbs” — a line of yellow plastic rising several inches above asphalt level — to keep motorists from making incursions into the bike lane. 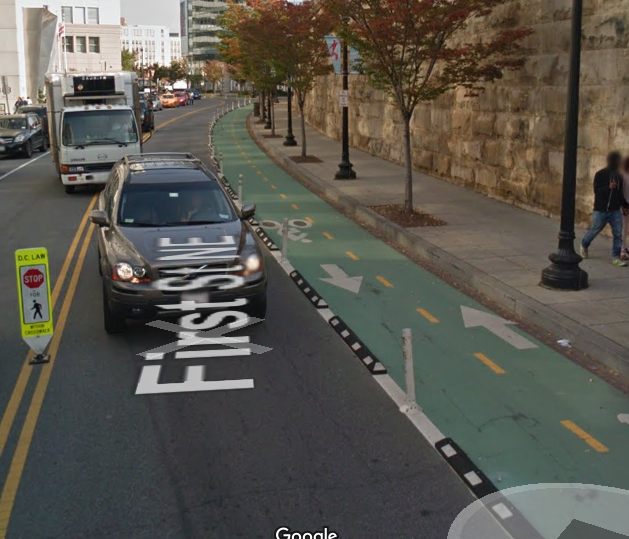 Now the new bike lane is in place, but the “tuff curbs” are nowhere to be seen, and DOT has no intention of adding them. That doesn’t exactly clear up why the tuff curbs were deemed unsafe, or why other options like concrete curb stops or vertical plastic posts couldn’t be used instead. The bike lane is least useful during the times of day when the most cyclists need it. From 7 a.m. to 10 a.m. between 52nd Street and 43rd Street and from 3 p.m. to 7 p.m. between 48th Street and 43rd Street, the bike lane is just paint on the ground. That doesn’t deliver on DOT’s promise to shrink the gap in protection on Second Avenue. When Manhattan Community Board 6 endorsed the project last summer, it praised DOT and begged for more. There are still 18 blocks of Second Avenue that lack protected bicycle infrastructure, even when the parking protection on the new segment in Midtown is in effect. If DOT won’t use tuff curbs, there’s another way to improve protection on Second Avenue — just make the parking lane permanent. That would require claiming street space from motor vehicle traffic that the agency has been loathe to touch so far, leaving cyclists with a stressful patchwork of a route on one of the most important bike network segments in the city. I’m assuming they realized that the “tuff curbs” wouldn’t keep motorists out, yet at the same time would make it difficult for cyclists the leave the bike lane to maneuver around the inevitable vehicles that would block it. posts make way more sense. why would you have a barrier that cars can get over? If the community board approved the plan with a tuff curb, shouldn’t DOT have to come back to the community board and explain why they won’t install a tuff curb? 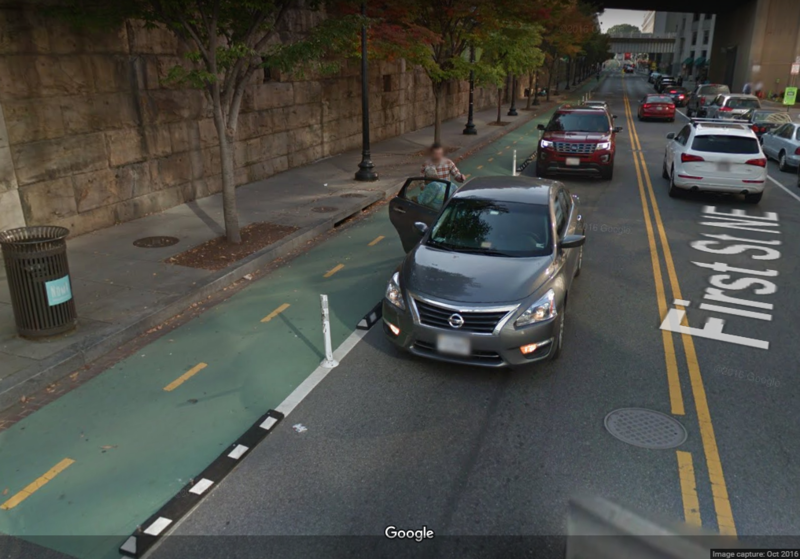 Yet again, when bike safety and convenience push against vehicle capacity, guess who loses. When a community board DOESN’T want safe cycling infrastructure, DOT totally folds. When a community board DOES want safe cycling infrastructure… DOT totally folds. DC uses park-its & flex posts with great success. DOT also hasn’t put in any of the promised curb extensions on side streets. They could’ve used flex posts, traffic bollards or even planters, which probably cost next to nothing. So yeah…Fail. The new section of bike lane on 2nd is a big improvement from before, just noticeably narrow. I think it mostly works because there are not many turns left from 2nd. I don’t know that the tuff curb was going to do much. The much bigger problem is the mixing zones, which are even narrower than usual and invariably blocked by loading vehicles and frequently trucks leading to blind hooks. And it’s anyone’s guess what will happen to the new lane during the UN assembly, since normally this space is seized for the NYPD parking/traffic lane. The whole corridor is a mess. The bus lanes are occupied by anything but buses. Aside from the completely lawless sections at the Queensborough bridge and QMT, the rest of the PBLs on 1st/2nd feel decidedly mediocre. The intersections need much heavier protection to encourage drivers to yield and reduce the impact of box-blocking. Given 57th and the one at ~55th and 1st, I can’t fathom why there is any support for more split-phase signals. You are channeled into a narrow lane next to confused or impatient drivers who may just decide to go for it at any time. After that, you’re squished between pedestrians and the occasional driver who decides to hook around the fools waiting for the red arrow. The greenway is still in pitiable shape. Leaving aside the subsidence, decrepit pavers, the automobile exhaust ambiance, and the gap in midtown from 37-59th, I have not seen a soul working on the 81st street east river pedestrian bridge since January, although I did notice about 20′ of railing went up slowly on one side over the last few weeks. Looks like they’ll finish by Christmas. If there is one place in the city where I feel fully entitled to bike on the sidewalk, it’s on East End between 79 and 83, where the neighbors have managed to delay this bridge for over a decade. They’re not wrong that the ramps should be prettier but these same neighbors double park and pull U-turns from the outboard lanes or intersections making biking in the street too risky for me. Certainly better than nothing, but but on the Christie bike lane, more than once I’ve seen cars simply go around the bendy posts and park in the bike lane anyway. It’s also disturbing to see how many of those posts disappear. I took Second Ave on Sunday, and found it largely impassable. Please tell someone in the DOT that just one car blocking the bike lane every two blocks can make it completely unusable — because you only get a chance to go in or out of the bike lane about that often, especially if it’s protected. If the bike lane is blocked once every block or two, it becomes safer to just ride with the rest of traffic. But if there are flexposts, where will my Uber pick me up? First Avenue on Sunday, too. But hey, if the NYPD does it too, then everyone else can too! Here’s a police car at the front of a line of non-police cars. All parked in the Amsterdam Ave PBL. 2nd Avenue is a very popular street. There pedestrians waiting to cross the street, taking a baseball style leadoff on most corners, and they function as human bollards. I regularly ride the section shown (also see 2nd picture below), and there’s never been an issue of cars jumping the posts & curb. Who can I email to complain about this? I live near here and this is ridiculous. “Accessibility concerns” such as concerns that cars would no longer be able to access and block the bike lanes? Pedestrians will claim that they trip on the posts when jaywalking. This morning's demo showed that the bike lane can be kept car-free during rush hour if sufficient steps are taken.